Many of us are looking for great ways to eat more fruits and veggies, especially when it comes to feeding our children. My husband and I worked with several feeding specialists over the last few years, and one of the tips we've found most helpful is to use dips to encourage little ones to try new foods. On the savory side, guacamole, salsa, bean dip, and hummus all make great dips for veggies, crackers, chips, and more. (Check out all the great ideas in the Blendtec Recipe Index for more inspiration) On the sweet side, we love something creamy that feels just a little bit decadent. This chocolate hazelnut butter has all the flavor of our favorite commercial brand without all the additives and artificial ingredients. 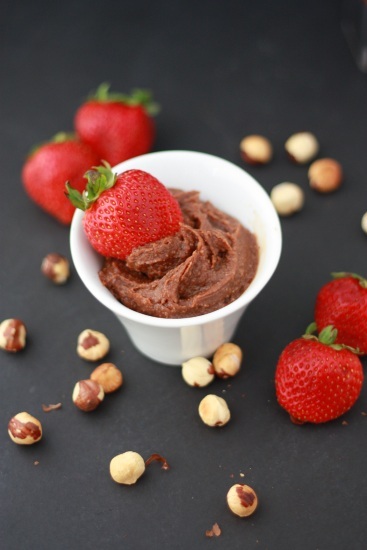 Using whole, natural foods, this chocolate hazelnut butter is a creamy, sweet treat. It will stay beautifully spreadable if kept in the refrigerator. You can spread it over toast, stir it into banana ice cream, or—our favorite—dip fruit and graham crackers into it for dessert. 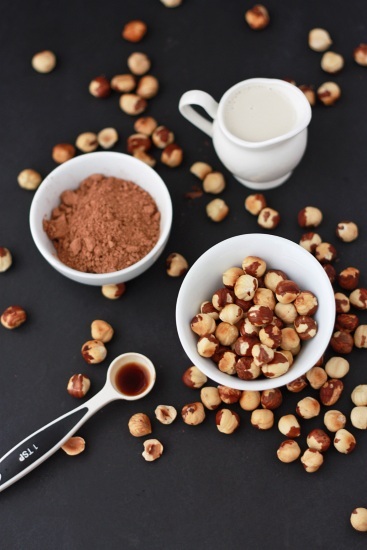 One tip: to toast hazelnuts, spread nuts out onto a baking sheet. Bake at 375 degrees for 8-12 minutes, or until skins have started to crack. Place the nuts onto a clean dish towel and rub together. The skins should come right off. If a few little pieces stay on, don’t worry about. (Gluten & Dairy Free) Ingredients: 2 cups toasted hazelnuts, skins removed* 3 tbsp unsweetened cocoa powder or raw cacao 3-4 tbsp unsweetened almond milk 3-4 tbsp pure maple syrup (or to taste) 1 tsp vanilla pinch of salt Directions: Place hazelnuts, cocoa powder, 3 Tablespoons of almond milk, 3 Tablespoons maple syrup, vanilla, and salt in the Twister Jar. Place Twister lid on jar. Blend on speed 7 for 40-50 seconds, twisting the lid counter-clockwise. Add additional almond milk if needed. Scrape down sides of the jar, taste chocolate hazelnut butter, and add additional maple syrup, if needed. I like a little bit of texture (the toasted hazelnuts have a delicious crunch), but if you want it perfectly smooth, continue blending another 10-20 seconds. Refrigerate and enjoy! *Hazelnuts can be a bit pricey. If you want to cut the cost, you can use 1 cup of almonds and 1 cup of hazelnuts. Hi! I’m Emily, blogger, recipe developer, and chief baby wrangler at One Lovely Life. My daughter Sophie has autism and sensory processing issues—our Blendtec has been a lifesaver! We’re gluten and dairy free for Sophie and love finding delicious new ways to enjoy our old favorites. Feel free to stop by and say hi! I started to make this and did not roast the hazelnuts nor did I remove the skins, but it was delicious. Next time I will follow the instructions on your recipe. Our family might be one of the biggest fans of ‘One Lovely Life’! We are recent followers and find every recipe a 5 star rating. The recipes are delicious not matter what eating restrictions or preferences you may have!